Little known fact about me...I'm crafty. Sometimes. As in, when I have time. This past weekend I was able to turn TWO of my ideas into actual, tangible creations. Both were super easy and super cheap. Get a canvas in whatever size you like, paint it whatever color you like, and use a contrasting paint color for your child's hand print. I used acrylic paint. It's cheap, non-toxic and comes in every color imaginable. 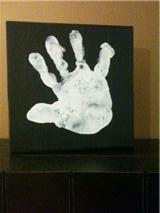 For baby 2, I will probably do a black hand print on a white canvas for a little contrast! Its a small picture & poor lighting so bare with me. 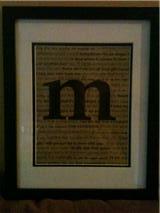 I had an old 11x14 frame laying around with a 8x10 mat in it, so I printed out the lyrics to our wedding song on a colored sheet of paper. I played around with the spacing and, though it's hard to tell, I made some key lines in the song bold or in a different font. So there you have it, two easy & cheap ideas for decorating. They also make great gifts! Do you like to craft?? Where do you find ideas? Do you follow craft blogs?